AFTER MONTHS of rumours and false starts, the Labour split has finally come. Seven MPs—Luciana Berger, Chuka Umunna, Gavin Shuker, Anne Coffey, Chris Leslie, Mike Gapes and Angela Smith—quit the party this morning. It has been a long time coming. All seven have been trenchant critics of Jeremy Corbyn, Labour’s left-wing leader, since he took power in 2015. Their criticism ranged from Brexit (where they see the Labour leader as a Brexiteer in a shoddy disguise) to foreign policy (where Mr Corbyn is seen as a danger to national security) and even economic policy (with the party’s direction dismissed as 1970s socialist revanchism). But at the top of the list was Labour’s failure to root out anti-Semitism in its ranks. Ms Berger, who is Jewish herself, said she had come to the “sickening conclusion” that Labour was institutionally anti-Semitic. A new party is not yet in the offing. The seven MPs will initially sit as independent MPs in parliament, under the appropriate moniker of The Independent Group. They will not fight by-elections in their seats. Another set of elections is the last thing voters want, they argue. For now, the group is simply seven MPs with a joint statement of vague values and a website asking for donations. Comparisons with the Social Democratic Party, a breakaway party that briefly shot to 50% in the polls in the 1980s before fading, are being made. But the seven bear little comparison with the Gang of Four, the former Labour ministers who founded the SDP. Between them, the seven can muster four years of ministerial experience, courtesy of Mr Leslie’s stint as a junior minister under Tony Blair. There is no one of the stature of, say, Roy Jenkins, the most influential home secretary of the 20th century and a former president of the European Commission, who led the 1980s breakaway. Other Labour MPs condemned the split. “Sit as independents, vote as independents, fight elections as independents and then independently help the Tories stay in power,” tweeted Jonathan Ashworth, Labour’s shadow health secretary. Not all the negative voices were loyalists of Mr Corbyn. Alison McGovern, the MP who leads the party’s Blairite Progress group, made it clear that she would stay. Labour MPs who dislike Mr Corbyn are generally content to sit it out. Tony Blair once ruled Labour with near-total control, but his time came and went. The same will happen with Mr Corbyn, goes their logic. Those who quit today did not have the luxury of time. Of the seven, all apart from Angela Smith sit on fat majorities. But the spectre of deselection, whereby party members back someone other than the sitting MP to stand at the next election, stalks Labour. Due to their principled reluctance to pledge fealty to a leader they deem incompetent, anti-Semitic and even a danger to Britain, Mr Umunna and friends were top of this hard-left hit list. Any fundamental reshaping of British politics will require more than seven MPs jumping before they are pushed. But the discontent to which they allude among Labour MPs—and many voters—is real. Some on the Conservative benches may feel similarly about their party, too. 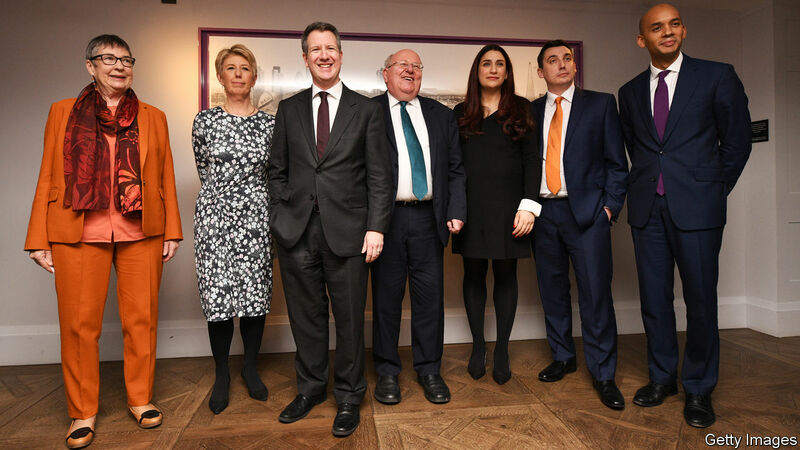 Whether more are willing to follow their lead will determine if the “Gang of Seven” will be a footnote in the history of British party politics or a new chapter.